A very well put-together gift set from Glenrothes. This little box contains three 10cl miniatures and 3 smaller, “Perfect Dram” glasses. The whiskies included are the Select Reserve, the Sherry Cask Reserve and the 2004 Vintage. The Select Reserve is a non-age-stated, traditional profile Speyside whisky: very easy to drink with lots of subtle caramel notes, orchard fruits and rich malt flavours. Bottled at 43% ABV. The Sherry Cask Reserve is a more complex, sherry cask whisky, which is also non-aged-stated. Aged entirely in first fill sherry casks, this gives this whisky a lovely spicy, fruity quality, with lots of jammy berry notes and some sweet wine flavours. The 2004 Vintage is a classic Glenrothes release, as the distillery is famed for its vintage whiskies. This whisky was bottled in 2017, and is 12 years old. This is a fruity and delicious dram, with a surprisingly tropical character. Like the Select Reserve, this whisky is bottled at the slightly higher proof of 43% ABV. 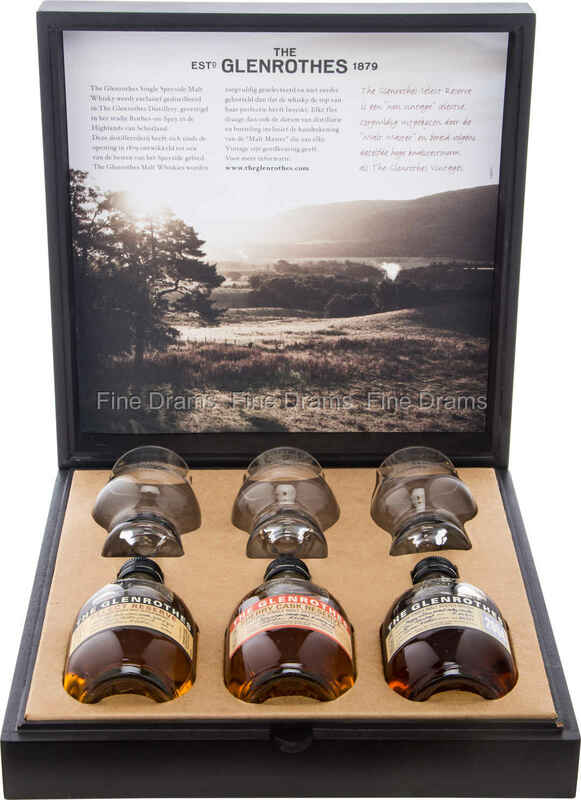 A top-quality gift set, which (with the glasses included) allows the drinker to have a side-by-side “vertical tasting” of some of Glenrothes’ key releases.